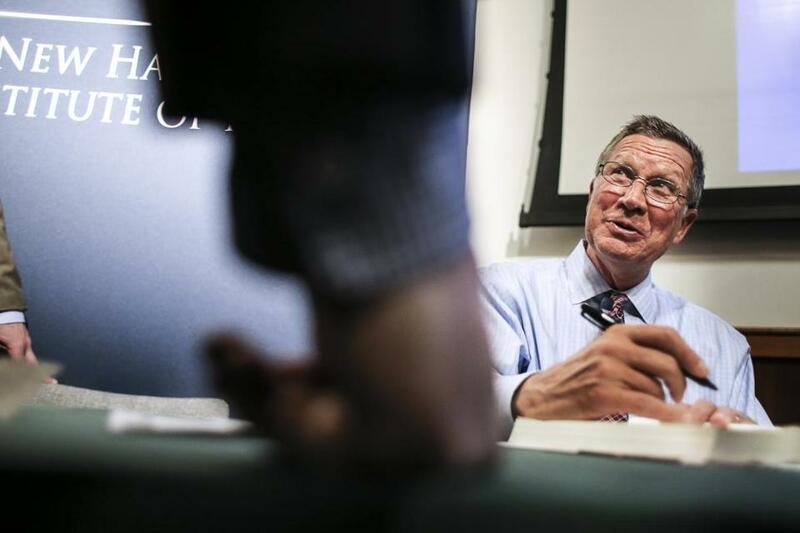 John Kasich holds a book signing for his new book, “Two Paths: America Divided or United,” at the New Hampshire Institute of Politics. As a kid, John Kasich stepped off a sandbar in Lake Erie and nearly drowned, leaving him fearful of the water. To remedy that, his mother paid for swimming lessons, but just being in the YMCA pool made him hyperventilate, so he skipped out and practiced his pinball instead. Only after watching the 2016 Summer Olympics did Kasich, now 64, really try swimming again. He’s improved enough that, his informal coach tells him, the pool-side observers who chuckle as their governor flails away in the H2O will soon have to find other amusements. The Ohio governor, former GOP presidential candidate, and apostle of positive politics is back in the swim in another way, with a new book — “Two Paths: America Divided or United” — that’s part campaign memoir and part reflection on the hyper-partisan maladies besetting American public life. So what advice does Kasich, who went from a narrow victory in his first gubernatorial campaign to a landslide reelection in 2014, have for someone else who’s over his head and flailing badly about? That is, Donald Trump. 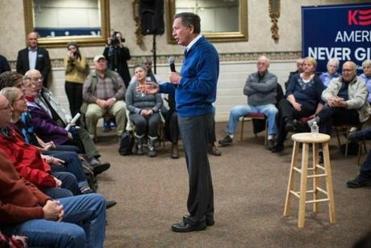 “You’ve gotta work to unify the country,” Kasich said in a sit-down on Wednesday. John Kasich has gained traction in New Hampshire with his folksy, optimistic, and mild-mannered approach. Read: John Kasich wants to sell you a book. Really. (Mitt Romney said the same thing). Trump’s reaction to that repurposed pearl of wifely wisdom? Kasich has also weighed in on health care, though to little avail, at least so far. His bottom line on the GOP efforts to repeal or rework the Affordable Care Act? “You just can’t strip health care coverage from the mentally ill, the drug-addicted, and the chronically ill and think that you’ve solved something,” he says. Would Kasich have done more to reach out to the other side? Kasich neither endorsed nor supported Trump last year. He didn’t even attend the Republican National Convention, though it took place in the Buckeye State. So: Is this book tour a signal he’s open to mounting a GOP primary challenge to Trump in 2020?